First a disclaimer. Just like me, most of you are probably Indians and cricket fans. To appreciate this book fully, you will have to forget about the Indian part for a while and just be a true cricket fan. For this book is about the history of cricket in Pakistan. Politically, they are our most bitter enemies. But their cricket is a thing of beauty, of raw talent and pure passion. With the decline of the West Indies, they are, quite unequivocally, to cricket, what Brazil are to football. This book was destined to be a great one from the beginning. It brings together a brilliant cricket writer and a fascinating subject, which surprisingly for cricket, was lacking in enough quality literature. Kind of reminds me of James Cameron and his story of the Titanic. You always knew that the movie was going to be something special. Like Cameron, Peter Oborne’s credentials are impeccable. His last cricket book told the amazing story of Basil D’Oliveira. It was well researched and a wonderful read, winning the prestigious William Hill Sports book of the year award in 2004. Oborne’s has, to the great delight of every true cricket fan, delivered a great book. It provides everything that can be expected of such a book. There is very little that one can complain about. It has a detailed chronological history, detailed portraits of the key characters, facts and anecdotes, a study of the game’s political, cultural, social and economic impact, mentions of all key events, an understanding of some unique traits and practises which make Pakistan cricket so special and finally a message of hope. It even covers women’s cricket and the popularity and spread of the game in the Taliban ruled war zones. Oborne’s research is thorough and the journey of Pakistan cricket is very well detailed. All the cricketing exploits are well chronicled. The book also covers cricket’s role in nation building and nationalism. How it put a young, fledgling country on the world map. And how it has always been inter-twined with power and politics. And all the madness that goes on. The book is broadly divided into three parts. The first part is about its beginnings and early struggles and is centred on the era of AH Kardar, second only to Imran Khan in his contribution to Pakistan and Pakistan cricket. The second part covers the period in which Imran Khan strode like a colossus and the third one is about Pakistan post Imran. Oborne intelligently focusses all his energies on the first two parts. He is lavish in spending time on key characters like Imran, Kardar and Fazal Mehmood, notable events like the Umpire Baig fiasco and the military coups, major cricketing rivalries like Islamia and Government College and significant developments like county cricket and professional contracts which shaped the game in the country. This is perfect because this is the period about which most outside fans know very little. We all know the corruption, infighting and match fixing laced part three and Oborne also seems to be in a hurry to run past these events. Thanks to the millions of interviews with past players and administrators, Oborne also offers a wealth of anecdotes. I was pleasantly surprised to read about AH Kardar’s role in uniting the Asian nations to break the white nations’ hegemony and his efforts in getting test status for Sri Lanka. He unearths some stories about Lala Amarnath which have never been talked about in India. This book does a fine job in bringing out the beauty of Pakistan cricket and in the end you are besotted. The invention of the doosra and reverse swing, the romantic tradition of unknown players being put directly into the national side, its unique tape ball tournaments, the fascinating stories of the likes of Mushtaq Ahmed and Abdul Qadir, the extraordinary clan systems and the list goes on. Oborne also writes about the resilience of cricket and the people who play it with passion all over the country. The game has survived everything and continues to spread and grow. It continues to give hope to its practitioners – an opportunity to rise above the troubles and shine in front of the world. It is heartening to read about the spread of the game, even in the war zones. Cricket is loved by both sides, who cooperate to organize twenty -20 matches as guns blaze and rockets fly. 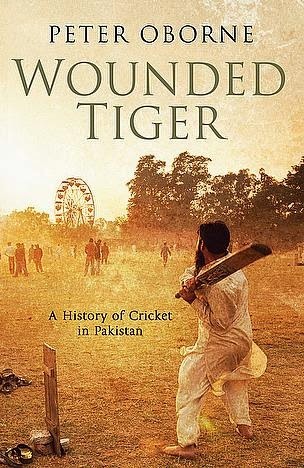 By the end of the book, as Oborne closes with a message of hope, you are converted into an admirer of Pakistan cricket. As a result it ends up doing a huge service to Pakistan cricket, which lacks enough friends and continues to struggle with matters beyond its control. The book has some minor flaws. It meanders sometimes but more often than not Oborne recovers quickly. Sometimes the writing is biased, especially against India but I guess Oborne’s affection for Pakistan cricket just gets the better of him. There are a couple of factual errors but they are very trivial ones. This book makes you wistful. You wish partition had never happened and we could have called these brilliant Pakistani cricketers our own. The combined talent pool would have created the most unstoppable force in world cricket. This book is a 5 star one for me and a must read for every cricket fan. It makes you appreciate everything that Pakistan brings to cricket and how we can’t do without it. Oborne’s book is heavy but you just can’t put it down.